Way too often in my life, I’ve either been the second kind or the third kind. But over the years I’ve gotten better. I’m doing a lot more of the “learn the easy way” approach. By “learning the easy way,” I mean either learning from the experience of others or learning from my mistakes the first time. “Learning the hard way” means trying to do it all on my own or failing to learn from my mistakes so I have to repeat the lesson. We are surrounded by example of people who just don’t learn, no matter how hard the lessons are. This line of thought was sparked by some tacos this evening. As I write this, I’m taking care of my disabled daughter because we didn’t have nursing coverage this weekend. Because time is short, my son (not the recipient of the aforementioned lecture) brought home a box of fast-food tacos, a mix of hard shell and soft shell. Growing up in rural West Tennessee, I ate my first taco at age 19 on a date. It was a disaster—not the way to impress a girlfriend. But she was patient and showed me how to not look like a farming accident (thank you, Susan!). I was embarrassed enough that I didn’t eat another one for probably ten years. Eventually, I learned things like how quickly hard shell tacos get soggy and disintegrate. In the long run, I even got good enough to eat while driving without having to get hosed down when I arrived (hint: easier to do with soft shells, which also tend to hold the moisture better). So when supper arrived tonight, I didn’t even have to think about it. 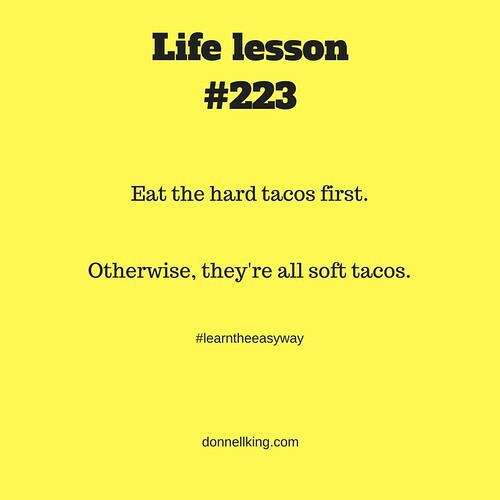 I quickly chose to eat the hard shell tacos first, because I learned from experience (mine and others). It’s a little thing, but the little things often exemplify the big things. How about you with your speaking skills? Do you figure, like some of my college students, that you already know all you need to know? You may be the third kind of person. It’s hard to teach those kinds of folks because they don’t know what they don’t know. But maybe you’re ready to learn from the experience of others and from your own mistakes. Maybe you’re ready to truly have the impact that you could on your customers and co-workers. Start with this. There’s even a surprise bonus there for you. And take my word for it: eat the hard-shelled ones first.